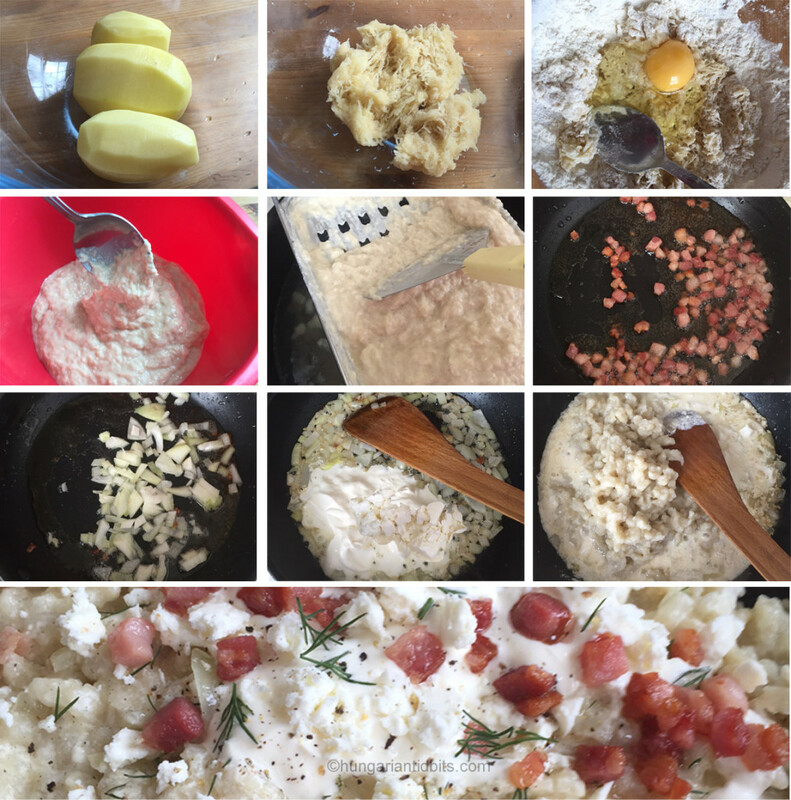 This characteristic soft egg noodle with finely grated potatoes in the dough is poached in a creamy sheep cheese sauce and has crispy lardons scattered on top. 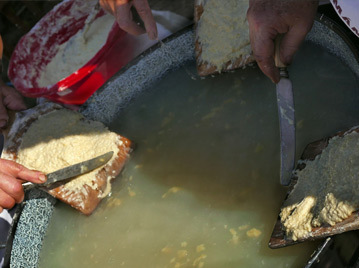 Widely known to originate from the Slovakian region, with Hungary as a firm fan. 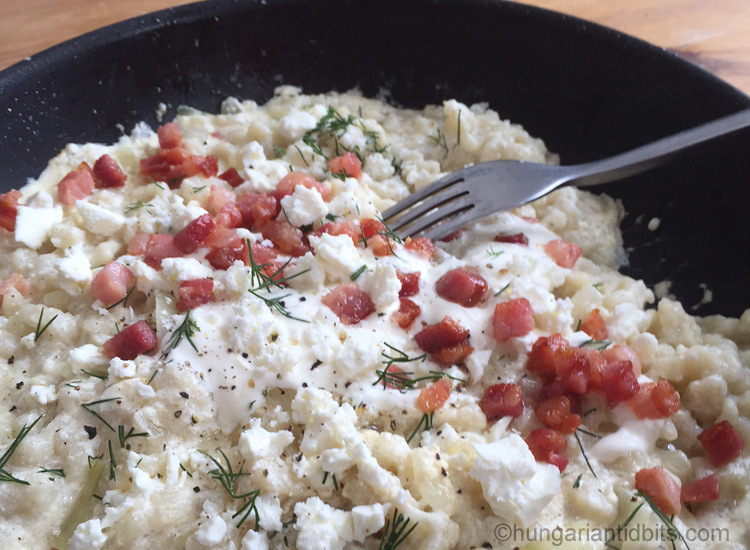 Hungarians mostly refer to this dish as “sztrapacska” these days, which is slightly incorrect but nobody seems to mind as long as they can get their fork into one. 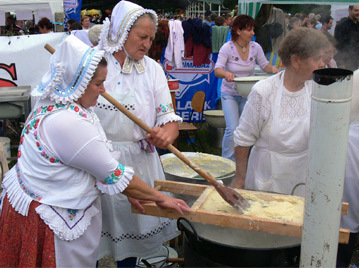 As an interesting side note “sztrapacska” is the name for the version with cabbage and meat (kapustové strapačky in Slovak) and the sheep cheese version is the “haluska” (bryndzové halušky). Slowly melt and fry the lardons in a larger frying pan, when crispy take the bacon bits out of the fat and set aside. Keep the fat in the pan we will use this for the sauce. Put a large pan of lightly salted water, just like for pasta, on the heat to slowly bring to the boil while we prepare the dough for the dumplings. Peel and great the potatoes on a fine grater then squeeze out the resulting liquid by hand. Transfer the squeezed grated potatoes to a new bowl if you need to. Combine thoroughly, then add enough from the rest of the flour to make the thick batter consistency, you may need less, you may need more. Now the water hopefully boiling, use a spratzel maker to create the small dumplings, alternatively you can make these without a special tool – use a knife to scrape small pieces of the dough from a tilted chopping board into the boiling water. Cook the little pasta droplets in gently boiling water until done – usually 5-7 minutes untill the potato in them cooks well – then lift out with a slotted spoon or strain and set aside for couple of minutes until we prepare the sauce. Taste and add more seasoning if need to, bear in mind the fried bacon bits you add at the end can be quite salty. Time to combine the sauce and the cooked pasta, mix thoroughly, heat through until starts to bubble, then take off the heat. Serve with a bit more sour cream and cheese crumbled on top, scatter the cripsy bacon pieces all over and hint with the optional finely copped dill or parsly. Tip: Don’t leave the grated potatoes or the dough made with them sit for too long, they can take on a grey colour. 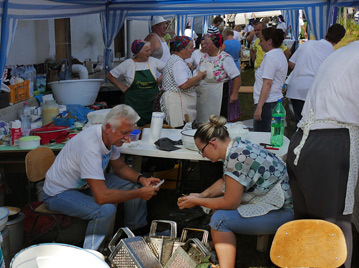 The Haluska Festival and Sztrapacska Cooking Contest is held in the little known picturesc little village of Vanyarc in Hungary every year. 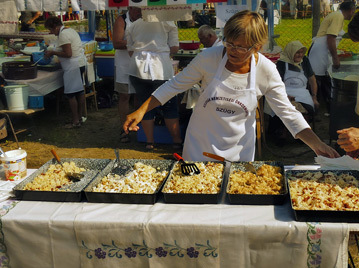 Teams made up by local folks busily prepare their best recipes to the delight of the sampling visitors. The event hosts other colourful programs, music and dance and local craft fair, must be a great day out! The pictures below are from a couple of years ago, but looks like the tradition still going strong with the next event on 9 September 2017. Industrial portions! These large two-men nokedli makers were often used when catering for weddings. Some of the contestants opted for the “chopping board” method. Behind the scenes.. potato peeling and greaters at the ready. 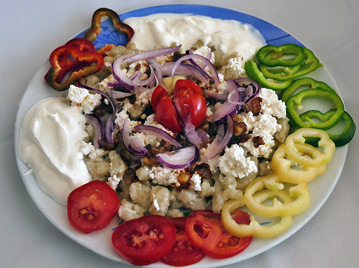 A variety of flavours, plain with bacon, sheep cheese, sour cream and cottage cheese, toasted cabbage.. The young generation of folk dancers. Many wore these beautiful embroidered costumes. Eva, I am back at work and my work computer will recieve your site. 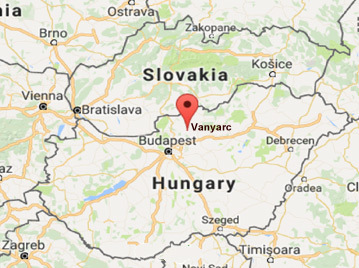 What is the correct spelling for the Hungarian T.V. Show; cooking and travelogue. “Itzarok”? Hello Ronald, Good to hear you’re now back to the grind! Is it the program called “Ízőrzők” by any chance? 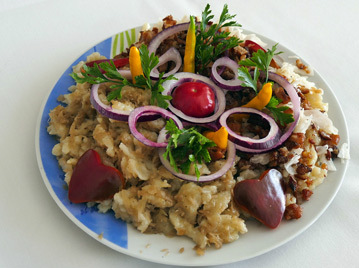 There are epsidoes on Youtube, lots of great traditional cooking by different regions of Hungary. I Teach in the Veteran’s Hospital where I also see amputees, and Orthotic patients. A new Resident from No. Western Univ. is 3/4 Hungarian, and remembers grandma making stuff! So I will get her to watch this show Izorzok. It has nice cuts of scenery mixed in. My Bride, Nancy , loves travel. I am not so sure about my wanderings. She wants to take kids to Tiszalok, and thereabouts, to see where Mom (Juliska) Erdely lived. Funny deal: Grandma Erdely’s maiden name was Balogh also. Same temperament as my dads people. That Grandpa was from Komoro, N.E. off the Tisza river. Coleman left in 1904 at 17. Was a horseman. U.S. Army tried to conscript him to chase the great Mexican Bandit, Poncho Villa! By then he was married and had 2 kids, and not a citizen yet. WAHLAH! Off the hook! I Teach in the Veteran’s Hospital where I also see amputees, and Orthotic patients. A new Resident from No. Western Univ. is 3/4 Hungarian, and remembers grandma making stuff! So I will get her to watch this show Izorzok. It has nice cuts of scenery mixed in. My Bride, Nancy , loves travel. I am not so sure about my wanderings. She wants to take kids to Tiszalok, and thereabouts, to see where Mom (Juliska) Erdely lived. Funny deal: Grandma Erdely’s maiden name was Balogh also. Same temperament as my dads people. That Grandpa was from Komoro, N.E. off the Tisza river. Coleman left in 1904 at 17. Was a horseman. U.S. Army tried to conscript him to chase the great Mexican Bandit, Poncho Villa! By then he was married and had 2 kids, and not a citizen yet. WAHLAH! Off the hook! This is the first personal citation. Your system said I already posted it before. I don’t think so.